On 1848-03-10 a barbarian ship arrived, sailing on the ocean surface at Kadekaru village in a distance of only about 3 miles from that village. Nineteen barbarians (derogative for: foreigners) divided on 3 wooden boats came riding to the seashore. They spoke a language that could not be understood, and wrote characters that were unknown. By making gestures with their hands they requested to be provided living cattle. The islanders gave them two living cattle as presents. The barbarians returned to their main ship and sailed away around nightfall. 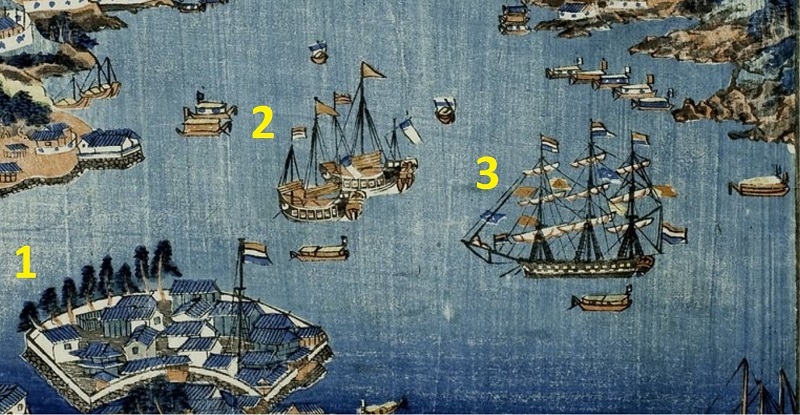 From seeing the form of that ship and the appearance of those people as well as their clothes, they looked exactly like on the drawings of Dutch persons and ships. Note: Dutch and Chinese traders were the only foreigners permitted to enter Japan for over two hundred years, from 1639 to 1854. The Dutch were confined to the man-made island of Deshima in the port of Nagasaki. They were a matter of huge interest among the Japanese and a huge amount of artwork was produced depicting them. Apparently it was from such artwork that the Okinawans estimated the visiting ‘barbarians’ to have been Dutch. The Dutch settlements at Nagasaki, late 18th century (from the collection of the British Museum). 1. The man-made island Deshima in the port of Nagasaki. 2. Japanese ships. 3. Dutch ship. Ca. 1830-1860 (From the collection of the Tobacco and Salt Museum, Sumida-ku, Japan).